Is Your Home Equity Line of Credit (HELOC) a Trap? Do your homework before opening a HELOC, and don't assume it's exactly the same as a home equity loan. For some homeowners, a home equity line of credit (HELOC) offers a solution for financing extended remodeling projects or other open-ended undertakings that require long-term funding. HELOCs generally offer variable interest rates that start off low, making HELOCs attractive sources of money for borrowers. Unfortunately, borrowers might also ignore the many drawbacks associated with these loans. Before you borrow from your home's equity, it is critical to understand exactly what a HELOC is, what it isn't, and how to avoid falling into financial trouble with this kind of loan. HELOCs Vs. home equity loans: What's the difference? In order to determine whether a HELOC is right for you, it's important to understand the difference between a HELOC and a home equity loan. Some consumers confuse the two or assume they are interchangeable terms. In both types of loans, a homeowner taps into their home's equity, which is the difference between the home's market value and how much money the homeowner owes on the mortgage. According to the Federal Trade Commission (FTC), a home equity loan has a fixed term, and you're required to repay the loan with equal monthly payments. Basically, it's a one-time loan that functions like a second mortgage. So if you don't repay your loan, you could face foreclosure. When compared with HELOCs, home equity loans generally come with higher interest rates because they offer the security of a fixed rate, according to MyFICO.com. A HELOC, on the other hand, is a loan that occurs gradually over a set period of time. It's a revolving line of credit, similar to how a credit card functions. Homeowners often choose HELOCs to finance extended projects, such as home renovations or remodeling projects. Like any line of credit, HELOCs come with a credit limit that you can't exceed. You may draw from your credit line until you reach your limit, and you don't have to pay interest until you withdraw funds. Easy Accessibility: Funds in a HELOC can be accessed at will. Whenever the borrower needs money, he or she can make a withdrawal, which can come in the form of a check or a credit card associated with the credit line. Credit Building: You don't need excellent credit in order to qualify for a HELOC (your credit score doesn't have a huge impact on getting approved for a HELOC, according to The Wall Street Journal. However, SF Gate reports a poor credit score can lead to higher interest rates and lender fees). And when used correctly, these loans can boost a homeowner's credit score. Tax Benefits: There are potential tax benefits that come with HELOCs as well. Unlike some other loans, the interest you pay on HELOCs (as well as home equity loans) might be tax deductible. According to The Wall Street Journal, "Up to $100,000 of the loan is tax deductible." As enticing as these benefits might be, it's important to evaluate the cons that come with HELOCs. 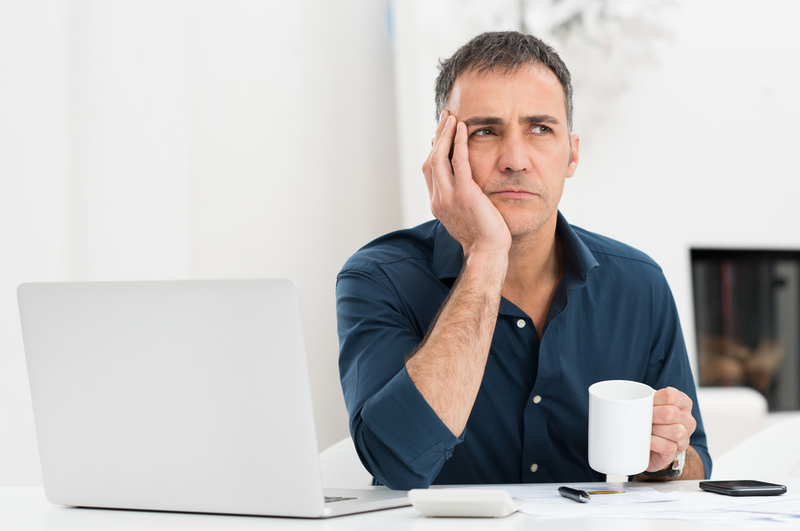 Below are three disadvantages you'll want to seriously consider before you commit to a HELOC. Possible Foreclosure: When a lender grants a home equity line of credit, the borrower's home is secured as collateral. So, if you default on a HELOC, you could lose your home. It's important that you make your payments on time. Risk of More Debt: Among the biggest problems associated with HELOCs is the potential to rack up more debt. Many homeowners might take out HELOCs, which tend to have lower interest rates than credit cards, to pay off high-interest credit cards. This strategy makes sense -- unless the borrower irresponsibly accumulates more debt on the credit cards and ends up with even more debt than before. Uncertainty: Another problem with HELOCs is the uncertainty that comes along with them. If your credit or the value of your home changes, the lender might reduce the amount of your credit line or freeze your HELOC altogether. Also, HELOCs have variable rates, meaning rates could spike quickly and dramatically, leaving the borrower without the ability to predict what the next month's bills will look like. If you are considering a HELOC, the single most important step you can take is to conduct research and do your homework. Understanding the terms of your HELOC, which can be trickier than traditional home loans, is the key to avoiding the financial trap this loan can present to unprepared borrowers. For example, be sure to find out if your HELOC comes with a large balloon payment. Some HELOCs charge only interest for the first few years and later come with a balloon payment, which is a lump sum due at the end of the loan, according to the FTC. Know the exact terms of your HELOC and understand how your rate can fluctuate over time before you risk your home. HELOCs might be popular among homeowners because of their low introductory rates, but remember that they come with some risks. Make sure you understand the terms of your loan before you sign. This article originally appeared in GoBankingRates.